I know- it's not the end of 2010 yet, but I have already decided on some goals for 2011. These aren't New Year's resolutions- they are goals I have set for myself. Quite simply, I want to run a personal record (PR) in every distance in 2011. I'm not looking to run a PR in every race- I simply want to finish 2011 with better times in every distance than I have in 2010. What really made me want to accomplish this goal is my time in the half-marathon. When I ran my first half, I wasn't sure I would ever want to run another. But within a week, I knew that I didn't want that time to stand as the best I could do in a half-marathon. 5K (3.1 miles) - 29:40. Set in April 2010. 8K (5 miles)- 49:50. Set in November 2009. So- there you go- by the end of 2011, I want each of these times to be lower than what they are now. I am really going to dedicate myself to my running in 2011, and hope that I am able to meet my goals. Last week while traveling, I was prompted to download an update (not the Froyo update- that downloaded with no problem a few months ago) and immediately started receiving an error notification that my application data space was too low. I didn't have many apps on my phone, but I deleted a few that I never used. On Wednesday, I gave the phone to my very tech savvy hubby to look at. He couldn't figure out why I was getting the error message either. In the middle of looking at some apps, my email program on my phone force-closed, and caused a restart of the phone. Well, the phone got stuck in the power-up cycle. It kept going to the screen where it says "DROID" and then would restart. As you can imagine, after the first few times, this got very annoying. Mike took the battery out and tried all sorts of things to reset the phone. None of them worked. So, Thursday morning I headed down to our local Verizon store. The tech specialist, Ryan, took a look at the phone and had no luck. He then called tech support, who also had no luck. 45 minutes later, Verizon said they would send me out a replacement, factory-restored phone. We picked up the phone from Fed Ex on Saturday and turned it on to make sure it worked. Everything looked ok, so we went and put a ZAGG Invisi-shield on it. So Sunday, after the 24 hours of waiting for the coating to dry, we attempted to use the phone. And guess what- the phone didn't work. As I said, the phone Verizon sent to replace my 4 month old phone wasn't new- it was a factory-restored/refurbished phone. It was supposed to go through a 100-point checklist before it was sent out. Turns out, the checklist needs item 101- that the phone connects to the Verizon network and can make a call. Yep, the phone wouldn't connect to the network or make a call. So, Mike went BACK down to the Verizon store with both phones (neither of which worked). He again dealt with Ryan with no luck. In fact, Verizon said we couldn't have a replacement for the replacement phone because we hadn't sent the first phone back yet. So, Mike came home and called Verizon Customer Service. After 30 minutes and 3 different people, Verizon finally agreed to send out a new phone- to arrive on Tuesday. But really, it's not a new phone- it's another factory restored/refurbished phone. Like the one we got that DOESN'T work. Needless to say, I am NOT happy with Verizon right now. I am looking at going on almost a full week without a phone. And they have done very little to help. We have had several dealing with Verizon customer service, and have found that they don't care. In fact, when Mike was on the phone with them yesterday, they asked him if sending a replacement phone would make him happy. He told them "No, I want a new phone." Their reply "I'm sorry you're not happy, but this is what we will do. This should make you happy." EEK! Last night my cell phone died! I thought it was something that could be easily fixed, so I took it down to Verizon. I thought, as a worst case scenario, they would have to wipe my phone and I would be starting over with my contacts. Well, that's not what happened. My poor little Droid Incredible was so dead there was no fixing it. And, like that wasn't bad enough, there are no Droid Incredibles in the area to replace my phone. So I have to wait for Verizon to send me a new phone. According to Verizon, my new phone should be here by tomorrow. But for today, I am without a phone. I hate being without a phone- it's a safety net when I leave the house, and I keep things in my phone that I don't keep elsewhere. I don't know my friend's phone numbers- I just have to touch my screen and my phone dials them. I can't just call them when I am out running errands. And this morning, I was out and my husband needed to get in touch with me. He had to call the house and leave a message- just like in the 90's! Our technology is great, but man, does it stink when we are without it!!! I recently had one of the most amazing experiences I could have ever imagined- a Behind-the-Scenes look of the new Times Square Disney Store! I was able to have this wonderful experience courtesy of the Disney Store President (Jim Fielding) and a contest he had on Twitter. 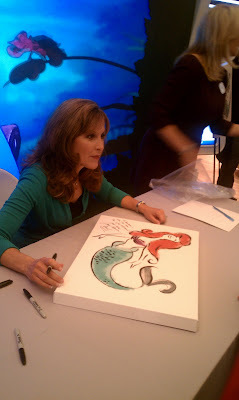 The event was a pre-opening behind-the-scenes look of the new store that included a continental breakfast, remarks by Jim Fielding, and the chance to meet Jodi Benson, the voice of Ariel in The Little Mermaid. It was everything, and more, that you would expect. I had entered the contest on Twitter, never expecting to win. When I got the Direct Message from Jim Fielding, I literally squealed with delight. I was on the phone with my mom, who doesn’t completely understand my Disney obsession. I replied to the DM with my email address, as requested, so his team could be in contact with me. Very soon after that, I got the first of several emails. I was surprised, although I shouldn’t have been, at the efficiency of the team. The emails contained information about the event, making me even MORE excited. Then, a little bit later that evening, I got a phone call from Mark congratulating me again and discussing a little bit more about the event. I didn’t know who Mark was, but I assumed he was an administrative assistant or someone along those lines. When I got home, I Googled Mark (oh come on- you would do it too….) 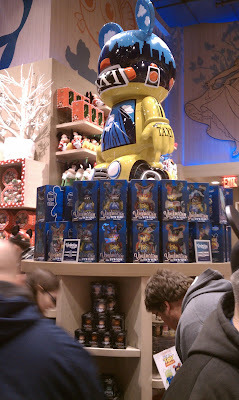 and my jaw dropped when I realized he is in charge of Experiential Marketing and Guest Experience at The Disney Store. Wow- Disney does this right! I couldn’t keep the grin off my face that whole evening. I was so excited I was ready to burst- I finally called up my friend Lea, who I knew would understand and share my level of giddiness. When it dawned on Mike and I that the NYC Marathon would be going on that Sunday morning, we decided not to hassle with trying to get into the city on Sunday, so we booked a hotel room and went into the city on Saturday (that experience will be a whole other blog post!). 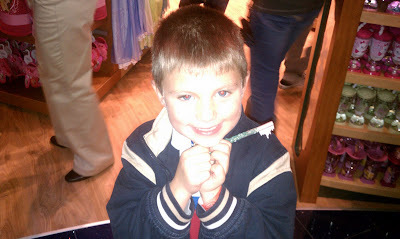 We arrived at The Disney Store about 7:20 in the morning. Check-in started at 7:30- luckily we were able to wait in the small lobby of the store, and not outside. It wasn’t the warmest day in NYC. Promptly at 7:30, they opened the doors and let us in. When I told them my name, the person checking me in exclaimed “Hey- you’re the Twitter winner. Congratulations!” I have to admit- that was pretty cool. 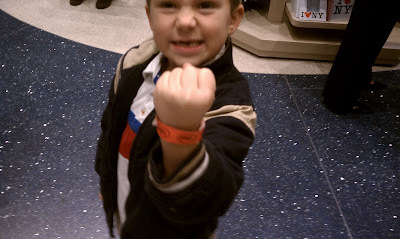 We got our wristbands and entered in. We had about a half hour to explore the lower level of the store. We made a bee-line for the special vinyls- we got the Statue of Liberty 3” vinyl, one 9” Taxi vinyl, and one 9”graffiti vinyl. What stands out the most about the shopping experience was how helpful the Cast Members were- it was like having a personal shopper in the Disney Store. They were getting merchandise for you, escorting you places, carrying bags… Really- could it get any better than that??? 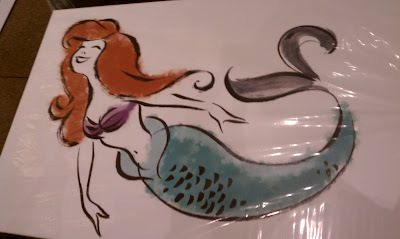 We also picked up one of the limited edition prints of Ariel that were created just for this event. Somehow, with all the time and looking around we did on the first floor, we totally missed that they had pins. Mike was bummed when he found out, because they have some really cool NYC pins. They had some new t-shirts and such that were really cool! 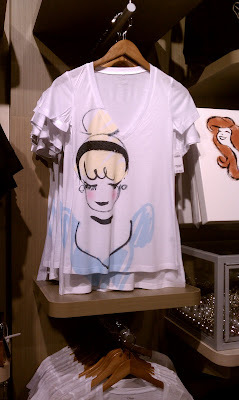 People who know me, know that I don’t wear much Disney apparel, but even I couldn’t pass up this cool Cinderella shirt! I believe they let in about 150 people for the event, and seems that they had about 75 Cast Members on hand to help. We felt totally pampered and special! 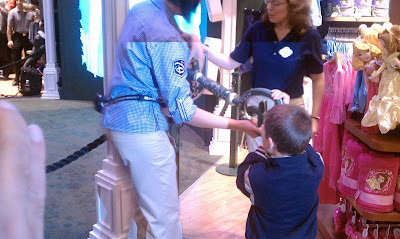 At 8:00 we were allowed to go upstairs into the “Imagination Park” section of the store. My first thought upon going upstairs was simply “Wow”. There was a ton of merchandise, but the store had a nice wide-open feel. All above were cute murals of various Disney scenes and characters- there was one scene with Peter Pan, Tinkerbell, and the Darling children flying above a London skyline that featured Mary Poppins. 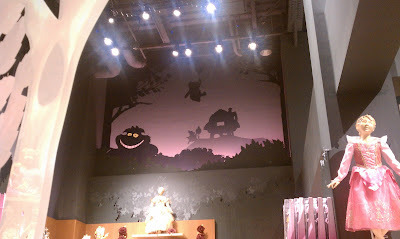 There was another section of wall that featured Winnie the Pooh floating above a scene from Alice in Wonderland. 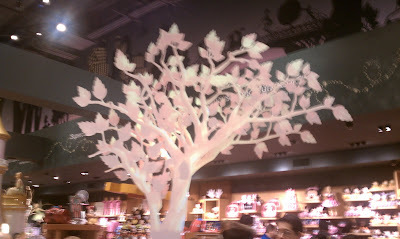 They also have three trees located throughout the second floor- each tree has a Hidden Mickey on it somewhere. Can you find the Hidden Mickeys? And no, I never did find any of them. Of course, I didn’t really spend the time to look either- there was just so much going on! I was amazed at all the different merchandise in the store - a whole wall for Tangled, an entire alcove devoted to Marvel Superheroes, and sections for Toy Story, Cars (complete with RideMakerz experience), and even Phineas and Ferb. 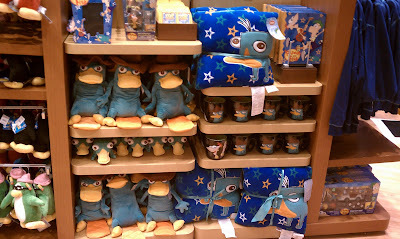 A Tor Story plush- where's @JimGarth? As we walked around the upstairs, I just went around with my mouth open. 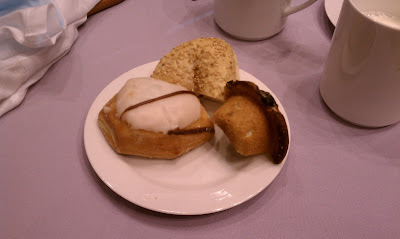 We grabbed a little bit of breakfast, and grabbed a spot to listen to Jim Fielding say a few words. I have followed Jim on Twitter for a while (and if you are a Disney fan and not following him at @disneystoreprez- shame on you!!!) and he is an absolute genuine, down-to-earth person. He spoke about the history of the store and what the expectations of the store are. It was really interesting hearing about the back story of the store, why they wanted that particular Times Square space, and what it takes to keep that store going- there are Cast Members working 24 hours a day! He also surprised me when he noticed me standing there and called me out as the winner of his Twitter contest. And even more surprising, he did this unprompted and without having met me in person yet- he really does value his Twitter experience. 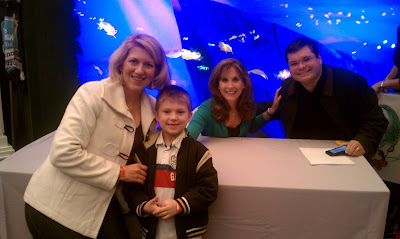 After Jim spoke, we were introduced to Jodi Benson- the voice of Ariel. At this point, Mike just glazed over and became focused on meeting her. His favorite princess has always been Ariel (I think it’s because of the sea-shells), and he was so excited to get a chance to meet her and have his picture taken with her. She also signed our print that we bought. After this, we continued to walk around the store and just marvel at everything that was there. 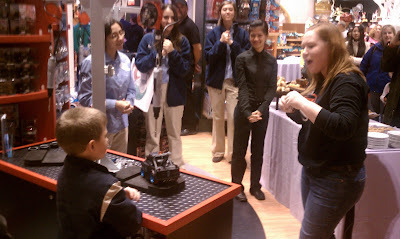 One focal point of the second floor of the store is Imagination Theater. 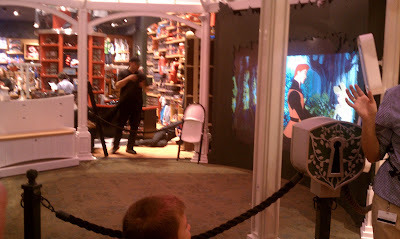 This is a small theater section where they have a video screen that plays Disney videos and clips. 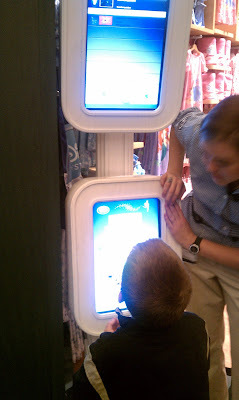 What makes this different than other Disney stores is that it’s interactive- using a touch screen, you can select what you want to see. Well, every day, they pick a child to “Unlock Imagination” in the morning. One of the Cast Members that we met was Suzanne, the general manager. She asked Matthew if he wanted to be the child who “Unlocked Imagination”. Matthew jumped on this chance and was beyond excited to be able to do this. The employees made a big deal of walking the huge key out to him and then making an announcement for everyone to come and watch. After Matthew unlocked Imagination, he was able to go in and pick what he wanted to see on the screen (the “Squirrel in my Pants” music video). 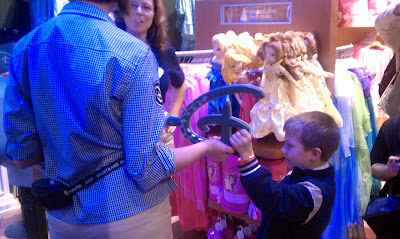 The Cast Members then gave him his own, smaller, replica key. 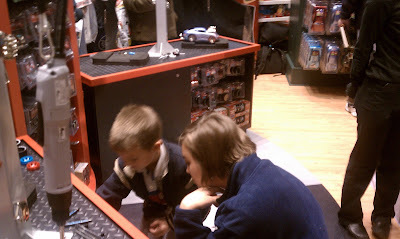 My son also experienced the RideMakerz car-building experience. 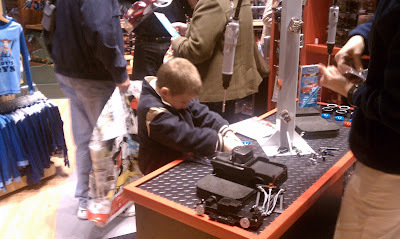 He picked out his own car parts and got to put them together. He picked out the black Mater (because he looks like we went though a fire- the mind of a 6 year old) and found wheels with his favorite colors. He then put various number decals on him. When he was done making his car, the Cast Member made a big deal about presenting him with the key to his very own car. I don’t think I have ever seen my son with a grin so big! We're going to WHAT at Disney??? There- I said it. We're going to use our OWN transportation around Disney World. Epic October gave me new insight to the joys of having a car at Disney World. There's no waiting for busses. You want to go from one park to another- just hop in your car and go. You don't have to wait. It was so easy and nice. And with the right driver, driving around WDW can be like it's own thrill ride! I mentioned my thoughts to my hubby when I came back from Epic October, and he just scoffed and said "No- we don't need a car. Their transportation is just fine." Then hubby went for a weekend where he had access to a car. And guess what he said when he came home... Yep- he agreed that having a car would be nice. 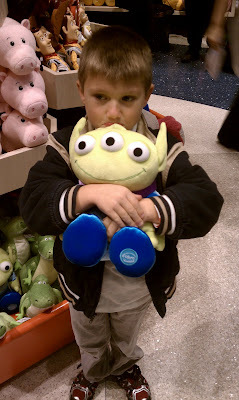 Now, I have always been, and still am, a supporter of the Disney transportation system. For someone on their first or second visit, you can't beat the simplicity of the system. From Magical Express, to the busses, to the monorails. It's easy- you just get on the right bus and they will take you there. No worries. But, I have also noticed a decline in Disney transportation over the last few years- the monorail seems to be down more than it runs, the busses come at longer and longer intervals, the busses are always packed, etc. For us, it's time to try something different.